We’ve talked about Google Sketchup here on pergolawning.com before, it’s one of our favorite places to go for design ideas for just about anything. There are plenty of great pergola designs there too. When we think of pergola designs, usually it’s the visual of the structure itself that comes to mind, rather than the various purposes that it can fill. With the right planning though, a pergola can be a cornerstone for many different backyard activities. A place for barbecues, or to use as a trellis for plants. One of our favorite backyard activities though is simply being lazy in a hammock, and a pergola can help there too! This is something I’ve always tried to design into outdoor structures. Tying off the hammock to two trees can be difficult, and can harm the trees in some cases. Also the shade cast by the trees may not be right to provide the most comfort. 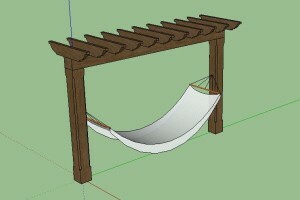 But with a structure like a pergola, you can design it in such a way as to provide just the right spacing for your hammock, to support the weight without causing damage to your landscaping, and also to provide just the right amount of shade to make your lazy afternoons in the hammock as comfortable as possible. One of the interesting things about pergolas is how they cast shade. Because the slats on top are generally rectangular, with one dimension much wider than the other, they will cast varying amounts of shade at different times of day, and even at different times of year. You can use this to your advantage if you plan properly. For instance, if you live in a generally mild climate, you might enjoy the sunlight most of the time. Perhaps only during the mid-day would it be uncomfortable. In such cases, aligning the hammock pergola stand North and South at the ends would mean that in the morning and evening you would have more sunlight than at mid-day. Also you could align the slats at an angle to not allow as much sunlight through in the summer as in the winter when the sun is lower in the sky. Of course in hotter climates, you might not want sun much at all. To accomplish this you’d want to extend the width of the slats up top so that they provide cover for more of the day. Or you could go with a more traditional pergola design with 4 posts, keeping your hammock between the Northernmost posts (in the Northern Hemisphere) so as to keep shading throughout the day. Another way to dramatically increase the shading a pergola provides is to run vines up it and let the plant canopy do most of the shading for you. This can even be a way to expand the amount of room you have for gardening, as fruits and vegetables could be trellised on the pergola. You see this commonly with grapes, but various types of melons, cucumbers, tomatoes and other productive vines could also be used.